Change Management PowerPoint template is a free theme for Microsoft PowerPoint that you can free download and use for any business presentation requiring a simple light template for PowerPoint presentations. 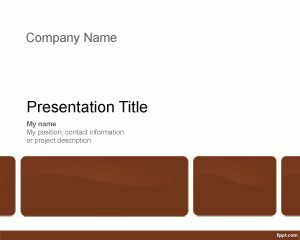 This free PPT template with brown boxes and white background is perfect for change management topics in your organization. You can use this background slide to create presentations on change management strategies and techniques or run a presentation on change management strategy to your employees in an organization. Best practices like ITIL change management techniques (ITSM) can also be combined in this presentation template to enhance your presentations. You can free download this change Management PPT template for Microsoft PowerPoint 2007 and Microsoft Power Point 2010.